With their biggest AAC game of the season coming up, how will the Owls fare against a UCF team that is currently on a 20 game win streak? Vince Coll and Dan Bartels look ahead to Thursday night’s matchup before Coach Collins holds his weekly press conference. 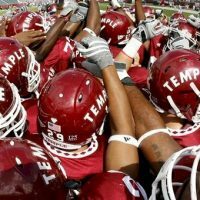 Reporter Jimmy Freas takes a closer look at the performances of Temple’s single digit players. Vince and Dan go “No Huddle” and finish up with another look at the AAC standings.